Savvy Southern Style : OMG! WHAT?? NO WAY!!! Those were my exact words the day I found out that my dining room made the cover of the French Country Style magazine. I still can't believe it! I was told by Fifi O'Neal a couple weeks ago and sent the photo. She told me I could share the news, but I wanted to see it in print before I shared my excitement! Well, it is out now and I am going to boast a bit because I just can't hold my excitement in! It hit the newsstands last week and I didn't even know it until someone left a comment on my blog on Thursday morning. I knew it was coming soon, but did not have an exact date. Later that morning I was standing in Barnes and Noble with several copies in my hand. The cashier said there must be something special about this magazine. Yep, my home is in it and on the cover. She said congratulations. I will be receiving a copy from Harris Publishing, but I couldn't wait for that. When Gridley & Graves photographers were here in February I didn't think my shoot would be printed until next year, but then I found out it was coming out this year. My shoot was supposed to be mid January and it got postponed so even the photographers thought it was too late for this year's issue. I am hoping to get some of the jpg. 's from Fifi and some outtakes to share. I think she is on the road doing some shoots at the moment. There was a cute one taken of Miss Bailey that didn't make the cut. Poo. I want to thank Fifi for choosing my home for her magazine and Gridley and Graves for taking wonderful photos. Also I want to thank Mary Forsell for the fun phone interview that lasted two hours and the wonderful story she wrote. These are just some of the shots in the magazine. It's an eleven page spread. Woot woot! I truly never thought this day would happen, but it did. Of course it never would have if I hadn't been blogging. You can see the first post and behind the scenes shots about my shoot here. Thanks so much for being a part of this blog journey with me. Oh Kim I am so happy for you!! Your home looks so beautiful! I can't wait to go buy the magazine. Well, damn! I didn't even recognize it as yours, Kim! I LOVE, LOVE, LOVE this magazine - bought it last Thursday, but have been so busy with Easter prep that I was too tired to read more than a few pages a t a time each night. I haven't even gotten to YOUR story, or I would've known. A big congratulations to you! FIfi really hit it out of the park this time for all that I have read. How exciting! Bet you're on cloud nine! Enjoy your week. Congratulations!!! Well deserved magazine spread!!! I'm so happy for you! I wish I could have a copy! Yippee Yahooooooo ... congratulations! The pictures are fabulous, and, the shot they chose for the cover is just perfect! A dream come true, indeed! Can't wait to get my copy! I bought a copy yesterday as soon as I saw they had a new issue out. Your home is lovely in it. I never get rid of my Country French magazine issues. They have a special box I store them in by season, and I pull them out and look through them each time I need inspiration. Congratulations Kim, what an honour to have your home photographed for the magazine. I dashed out on Thursday to get a copy of the magazine. I enjoyed the story, too, of all the hard work you and hubby have put into your home. Everything looked simply beautiful. So, so thrilled for you! Well deserved, too. Your home is gorgeous! Congratulations, Kim!!!! I don't blame you for being so excited! Your home is beautiful and the pictures look beautiful here. I'll be looking for a copy of the magazine. Cannot wait to get my copy. Very well deserved. Your home is an inspiration to me. Congratulations! You've worked hard and set your dreams high, and they've come true. You are truly an inspiration to all that come here. Thank you for always sharing your beautiful home and your dreams come true with us each day! Well, I knew that this day would happen for you!! !....It is so surreal looking through the 11 pages of pure beauty . . Congrats again Kim!! !....I know you are still on Cloud Nine!!! or maybe Ten!! Oh Kim, this is so fantastic because your home is very magazine worthy!!! The beauty and style of your home really shines on the pages of the magazine. I couldn't be happier for you to be recognized in this way. You and your home definitely deserve to be highlighted and given front and center attention in this fabulous magazine!!!! What a thrill! Congratulations. The pictures are beautiful. Hi Kim, I couldn't be happier for you! How exciting!! I can't wait to get my hands on my own copy to enjoy. Congratulations!! That is totally awesome! You must be so thrilled! oh so exciting, I always thought your home belonged in a magazine, congratulations!!!!! Wow - congratulations! It is so well deserved - your home is gorgeous and unique - definitely magazine worthy! I'll be picking up a copy at Barnes & Noble today! Kim, I have never purchase this magazine, but I truly love your home. So through your blogging this magazine knew this would be a win, win for all. Congratulations. Wow, wow, and WOW! I always purchase these magazines, and they are the ones I keep and look at again and again. Years ago, I fell in love with the warm, comfortable, and stylish feel of your home. This honor is well-deserved! Congratulations! I can't wait to pick up my copy! Congratulations, Kim! That's so exciting - you must be thrilled! Congratulations. It looks amazing. What a wonderful fulfillment of your dreams. That's just crazy to see your own room on the cover of a magazine! Then again, I'm not surprised and I wonder what took them so long to do it. WOOT WOOT, and congrats!!!!!!!!!!! SOOOOO well deserved, your home is TRULY "magazine worthy"!!!! I am so excited for you and can't wait to get my copy too!!! I will be searching today to get it. Oh my heavens, Kim! That is soooo awesome! I can't even imagine the crazy excitement you must be feeling! Congratulations!!! Your home is beautiful! Just love the pops of red that I see here and there in the photos. It would've been awesome to be there when your home was being photographed. Again, CONGRATULATIONS on your wonderful news! Congrats Kim, how exciting for you :) I will have to locate a copy! Oh Kim I am just so happy and excited for you! How wonderful! You totally deserve this! How totally fabulous and completely exciting!!!! I'm going to go out and look for a copy! Congratulations! Congratulations! That is so exciting! I can't wait to get a copy and check it out! Congrats Kim! I can't wait to read the magazine too! Oh my goodness, Kim - so happy for you! You totally deserve this and the photos look fabulous! Can't wait to get a copy! Agains so happy for you Kim! You made me tear up with excitement for you. Oh, how thrilling!! Those people at the magazine obviously know style, when they see it. I have always loved your dining room!! WOWZA!!! I have goosebumps! This is so awesome, Kim! What an honor -- you surely do deserve to have your beautiful home showcased. And 11 pages!!! I am so thrilled for you, and thank you for reminding us that dreams do come true! Congratulations! Congrats, Kim! The shoot looks absolutely beautiful. Thank you for being an inspiration to home bloggers everywhere! Congratulations, Kim- what an awesome experience! Your home is beautiful, and no surprise that you would grace the cover of French Country Style magazine. I need to run out and get a copy today! Oh wow! I'm going out this afternoon to purchase a copy. Congratulations. Your house is truly one of the prettiest in blogland and maybe all of the land. You deserve every accolade you get. Congratulations, Kim! I know you're still pinching yourself! Your home is lovely and truly deserving to be published! What a fabulous experience! I'm thrilled for you! OMG Kim, front cover?!!!! Simply fabulous and I am so happy for you!!!! have to grab my copy soon! Congratulations!!!!!!! Congratulations! So deserving! Your home is beautiful! Getting a copy for sure! Well of course it made the cover silly, it's a beautiful room designed by a beautiful woman! :) Congrats Kim, you truly deserve it! Congratulations Kim! So exciting and very much deserved! I will definitely go out and get a copy. I'm so happy for you getting, not just in the magazine, but on the cover. I bought me a copy and have been enjoying reading it. What a beautiful job they did photographing your home and really showing how what a wonderful home your have created Kim! Congratulations ! Your house is amazing ! Congratulations Kim....and thanks for the reminder that dreams can come true! I'm so excited to actually know someone (through blogging) whose home is featured in an awesome magazine! Congratulations, Kim!!! Your home is beautiful and well deserved! Congratulations!!!! This is so exciting. I did go buy a copy. I am totally thrilled for you. I picked up a copy on Friday and literally gasped! It is so absolutely beautiful! Congrats!!!!! Hooray! Congratulations Kim! Your home definitely deserves to be featured in a magazine! I have to go buy it now! So excited for you Kim, congratulations!!!! I can't wait to go pick up a copy, hoping you don't mind but I plan to bring mine to Haven for you to sign! You are so incredibly talented and have created a truly gorgeous home that is so deserving to be in a magazine and especially on the cover! CONGRATULATIONS YOU!! SO thrilled for you Kim! Your home is beautiful and a perfect fit for that magazine and the cover- awesome awesome!! Wow! So happy for you! These are beautiful photos of a beautiful home. Congratulations! That is one of my favorite magazines!!! OMG is right! I have today off and am going to go over and get it! You are officially a superstar! I told myself to cut back on buying magazines for a little bit BUT I just have to break the rules and get this! 11 pages and the cover... oh my!!!!!!!!!!!!!!!! I'm off to Barnes and Noble asap to pick up a copy. What fun! Congratulations on this well deserved honor, Cover Girl! I'm in awe of how you've grown your blog and the national attention it has brought to you. So excited and happy for you, Kim! Your home is so amazing, it's well deserved. It must be weird, though, to see your own house printed. Congratulations again on being featured in French Country Style. Not only are you and your home worthy of a national magazine spread, your blog provides magazine quality every day. I never tire of reading your posts and looking forward to what's next. All of which inspires me in fluffing my own little nest. P.P.S. So Kim, are you having a Give-Away for a signed copy of French Country Style? You know all of us would love a chance to receive such a special copy. CONGRATS my friend I am so happy for you!! Heading out today to grab a copy!! How exciting but not surprising! I always say your house is magazine worthy!! Gorgeous! Congrads Kim!! Congratulations Kim! Looking forward to seeing it. Such an honor!!!! and making the cover....You must be thrilled....ofcourse your home and your decorating is so gorgeous why should we be surprised....Congratulations you certainly deserve it....I am running out to B & N to pick up a copy.....Bravo!! Oh, Kim! That is so very exciting! Congratulations...not just getting published, but even making the cover! That is awesome! I'm so happy for you. Thanks for all the inspiration you provide to your readers each and every day! Oh Kim this is so exciting. Congrats. What an honor to be in this gorgeous magazine and on the cover to boot!!! Wooo Hooo! so excited for you. I cannot wait to get my copy. Your home is beautiful and I am so happy that they put it in right away. Congrats!! This is a magazine for sure that I must get.... I know I will look at your beautiful photos a million times!!! What a fabulous post to open up this afternoon, Kim!!!! I'm doing cartwheels for you! LOVE LOVE LOVE the cover. I'm bringing my copy to Haven for you to sign... as soon as I run out to B&N to get a few copies! Congratulations, Kim! It looks absolutely wonderful! Very cool and a BEAUTIFUL cover shot! Congrats to you!! It does seem effortless for you Kim! Congrats! Congratulations on this great achievement!! Your home is beautiful and now even more folks can enjoy it! Wow, Kim! 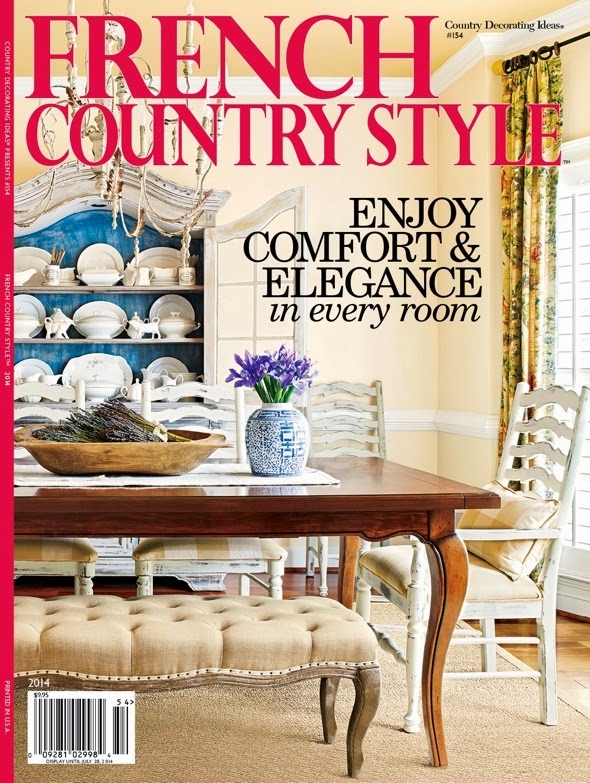 I recognized your dining room on the cover of French Country Style instantly. I love that magazine and wondered when the new issue would be out. I looked today and saw your room. WOW! It is a well deserved honor. Congratulations. Enjoy this honor. Congratulations Kim! I'm so excited for you and can't wait to get my hands on a copy. Truly deserved! Kim what fabulous news! I have the goosies...yay!!! I will be running right out to buy a copy today. You are sooo right NEVER EVER give up on your dreams! And this honor gives us all the hope we need to stick with ours. Congratulations...the cover of French Country Style magazine never looked more beautiful!!! Congrats!!! It is funny because I was at Barnes and Noble and picked up the magazine. I kept thinking to myself this dinning room looks sooo familiar and when I read the article, I was giddy with excitement for you! Sooooooo thrilled for you Kim!!! Your home is absolutely gorgeous and the title "effortless elegance" captures it just perfectly! Congratulations friend! Wanted to stop by and officially congratulate you here on the blog! Kim, you must be on cloud nine. I'm so happy for you. I know it's a dream come true, and the cover to boot!? So happy for you!!!!! I am so happy for you!!! Congratulations! It is well deserved! this is so amazing! can't wait to see the magazine. Splendid news and to be on the cover! This is the most awesome news ever!!! Congrats to you my friend. As I said on Instagram this morning, I can't wait to pick up a copy! It looks great! Thanks everyone. I have individually commented back to each of you that I could. Some of you are no reply comment blogger and I cannot comment back to you with that. I'm so excited for you, Kim! You deserve an 11-page spread, that's for sure. But to be on the cover. . . that's absolutely amazing! Good for you, girl. I am so proud of you!! I picked up that magazine just the other day. I immediately recognized your house. Congratulations! That is SO fantastic! I love that magazine and you deserve to be on the cover!!! A big Congrats! I can't wait to see it in print! Congratulations, Kim. I'm no surprised that your home was selected. It's lovely. Congratulations Kim! You deserve it! Not only because your home is beautiful but because of the love and passion you put in your blog sharing all your deco news and ideas with us. Boy hearing about this brings back so many memories of when Harris Publishing called me back in 2005 for their Country Decorating Ideas magazine. They sent out Anne and Gary (Gridley & Graves) for a two day photo shoot. I had to wait a year and a half before it hit their magazine. What you might not know is that my pictures hit five other magazines...all Harris Publishing. I called the editor and asked about how that could be and she said that when they get the pictures from G & G, they load them into the computer and anyone writing an article that needs pictures can use them for any and all of Harris Publishing magazines. At the time, my backsplash was painted to look like tile turned like diamond shape. There was one of their magazines with a full page of my kitchen along with other pictures that were not my home that all had diamond shapes on floors, bathtubs, etc. You don't get credit for it either. No name attached. They just have free reign to use your pictures how they want after you signed the rights away to them. Just thought you might want to know. Congrats...it is such an uplifting experience isn't it. Yes, Terry, I do know my photos can show up anywhere. Now, they can have other publications even bid on them. I didn't sign anything, but I know they own those photos and can do as they please with them. Congratulations Kim! I have not even ever had a cover. WOW! That is great! I know you work hard to make your home a comfortable place. It is rewarding to see it featured in a magazine. Now, aim even higher! Enjoy! Is this the first time your home is featured on a major mag?? It looks truly stunning, I can hope one day I will be featured on something similar. I grabbed a copy today after work and the pictures are truly outstanding. You deserve this....I so admire your work, and your home pics. I couldn't agree more Kim, you really do deserve this! I love following your blog. Its the first one I look for every day. I have to say that although I love all of your home, your dining room is my most favorite and I could look at it every day. I just love what you have done there more than I can say! Kim you have truly reached the "big time" and it couldn't have gone to a better decorator and all around "do it yourselfer". I think you are probably self taught which proved that you don't have to have a degree just vision for the job at hand and the willingness to stick to it until you get the look you want. Congratulations! I want to know what Mr. Savvy has to say about it all. He may never roll his eyes again! Congratulations Kim...so happy for you!!!!! As I mentioned in FB this is so exciting and you should be so proud and this is well deserved. I adore your home. It's so warm and inviting. Congratulations! I saw this magazine and LOVED the cover and even told my husband about it. However....I did not purchase it, but will go back and buy it now! Love your blog, love your house! Congratulations again! Congratulations, Kim! I haven't seen the magazine, but I'm sure it's wonderful. What wonderful news, and well-deserved recognition. Your home is beautiful, and I am so happy you are being recognized for your creativity. Cant wait to buy a copy and enjoy sitting down with a glass of tea and the magazine. Kim, this is such a huge honor and a tribute to your talent and hard work! I am sooooo excited for you. I'm going out tomorrow to find a copy! Congratulations!! How fabulous!! Your home looks terrific in glossy pages!! Kudos for all your great work!! Wow, wow and wow! that is so incredible, congrats!! How wonderful! I'm so happy for you! You deserve it! Wow! Wow! Wow! You Savvy Southern girl! So happy that I could be a part of your blogging journey & Houzz! I have enjoyed your color changes and furniture moves! You always bring a ray of sunshine to my day! From your Savvy Southern California Fan! Wow Kim!!!! This is beyond exciting!!! You must be on cloud nine! But quite honestly it doesn't surprise me one bit, you have a gorgeous that is well deserving of a magazine spread and front cover feature. I'm going to go purchase the magazine and brag to everyone that I know you hahaha. Congratulations and now go CELEBRATE!!! Congrats Kim....takes a lot of hard work to look effortless which you seem to achieve easily? Did Miss Bailey make the mag too.. Really cutie pooch! No, Bailey was left out. She had posed so cute for them, too. I hope to get a couple of her shots. Yes, I had to do the cleaning, but I didn't go nuts with it. I knew what things weren't going to show in photos. One of the team did a little styling. Not a whole lot was changed in my shoot. Kim, picked up a copy this afternoon. Fabulous article and outstanding issue all around. It's one of my favorite publications. What an honor to be in this publication, and on the cover no less! Again, congratulations! How exciting! You must be so gratified and proud,and, well you should be with all the beautiful and cozy touches that you have added. Congratulations Kim! Enjoy the thrill. I can't wait to get a copy to peruse all of the photos. Hi Kim, I'm thrilled for you! We've been out of town and I've been trying to catch up. I'll be picking up a copy as soon as I can get my hands on one! Congratulations on your beautiful spread! Congrats! Beautiful room, beautiful home, couldn't have happened for a more beautiful person. Well deserved. Congratulations Kim! The photos look fantastic! Looks like I'll be going to Barnes and Noble today! Oh Kim.....I know you are over the moon about this and I share in your happiness:) Your home is beautiful and I can't wait to see the article. French Country Style is one of my favorite publications! I have always said to myself...when I visit you..."I can't believe that Kim's home hasn't been featured in a magazine, yet!" I know you work your buns off to inspire! I am sure that editor said..."What are we waiting for?" Now every one with a shopping cart gets to see your "SAVVY" ! Long time reader of your blog, so proud and happy for you. Keep up your wonderful blog. Thank you for letting me in your home everyday. Nancy D.
So happy for you! This is a very well deserved honor. The title did crack me up a little. "Effortless", for them maybe. You do make it look easy though. Wow!! What an honor for you Kim. That's so wonderful to have your home picked for this magazine shoot. I have to see if I can get my hands on a copy of this issue. I am so happy for you! How exciting!!! I am so thrilled for you and can't wait to pick up a copy!!! Like Diana, I am late to this party too. CONGRATULATIONS! What a well deserved honor. I will definitely have to pick up a copy of the issue. It looks great!!!!!!! Thanks, Kelly. I can't wait for yours to be published! You have no reply comment blogger on in case you didn't know that. I'll be picking up that magazine bright and early tomorrow morning so I can check it out in person! Congratulations! It could not have happened to a nicer person! All your hard work (although fun work) has paid off! Kim, I am so happy for you! Your home is a perfect fit and the photos are absolutely stunning. And the cover - beyond exciting! Can't wait to pick up a copy! Congratulations Kim! Your home and the photos are just beautiful. That is wonderful and well deserved! Congratulations!!! Congrats to you Kim...they couldn't have chosen a more beautiful home! Congrats Kim - how exciting - raising a glass to you! Awesome Kim!!! I can't wait to go buy a copy! I know you are tickled to death, as well you should be......and we all happy for you!! WOW KIM!!! I'm so excited for you and us, caz we're your friends and often see your beautiful house and I'm not surprised, it's more then certainly, magazine worth!!! Congrats hon...and on the cover...wow again! I'm so glad you had a link to this post at Wow us Wed as I missed it! Congratulations Kim! Your home is gorgeous and you have a wonderful knack for decorating which while incorporating trends, also reflects your unique style. It is no wonder a magazine would want to do a feature on it - I'm sure there will be more in the future! Congratulations Kim. You deserve it. Your home is amazing. Thank you for sharing your life with us. A dream come true!! It validates everything we already knew! Your talent is innate and this is what you were meant to do. Congratulations!!! Yay!!!! Kim, I am so excited for you! The spread looks amazing. Gridley and Graves did a fantastic job and your house looks incredibly beautiful. Congratulations! Congrats Kim! I saw this magazine while at Lowe's and thought the cover looked familiar and sure enough it's your dining room. I'm thrilled for you! You got some great coverage. at here are some other great homes in this issue too. Congratulations Kim! I picked this magazine up tonight at the pharmacy and noticed right away it was your dining room! How fabulous! The article was wonderful! Congratulations! You deserve it! I need to go out and get a copy! I'm a little late with this, but congratulations! I have the magazine issue and was marveling about the home in the mag, but didn't realize it was yours. I was on someone else's blog and linked to yours and well, you know the rest! I loved the mag and everything in it! Love your blog too and I will be signing up to follow your blog. "I know her, I know her!" That's what I felt like saying when I saw the cover of my favorite magazine! Congratulations!! You definitely deserve it. As a loyal Savvy Southern Style follower, I've enjoyed watching the evolution of your beautiful home and love your style. I almost feel like I've visited your gorgeous home and actually do know you. And I have to add, yours was the most beautiful home in the whole issue. Again, congratulations! WOW!!!!!!! That is the coolest thing EVER!!! I LOVE THAT MAG!!!! I will be out searching for it and taking it over to my Sons house today for mother's day to show everyone! Very happy for you! I'll bet Doug is so proud of you! I'd recognize that front page pic in a heartbeat! No one would have to tell me whose house those pics are from! I love your design style. It is beautiful yet simple and it resonates with a lot of people. Congratulations on your well deserved feature!